Index funds have put the $6 trln asset manager over a barrel with holdings in gunmakers. Now BlackRock is responding with new products allowing investors to avoid producers and retailers of firearms. It’s more than what the NRA might call virtue signaling – it’s good business. 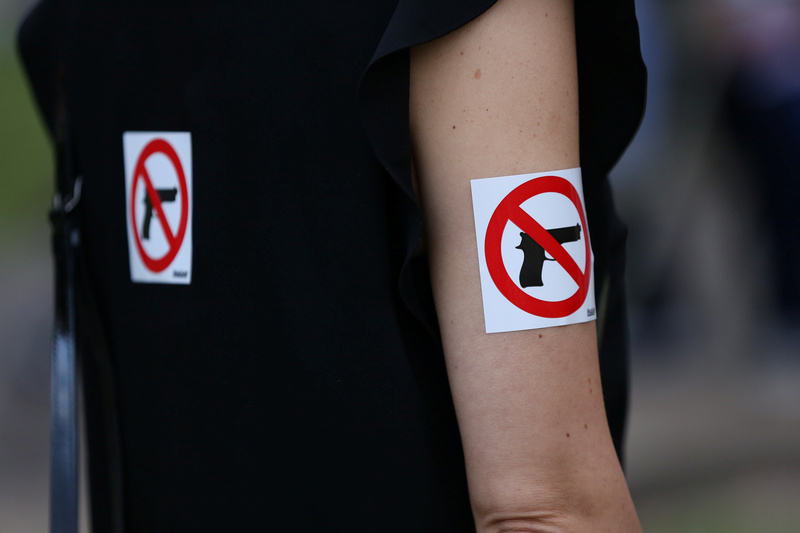 A woman wears stickers in protest of gun violence before the "March for Our Lives", an organized demonstration to end gun violence, in downtown Houston, Texas, U.S., March 24, 2018. BlackRock, the world's largest asset manager, on April 5 unveiled plans to offer a handful of new products that will allow customers to invest in index funds that exclude firearms manufacturers and retailers. The company expects to launch a new variant of its iShares MSCI USA Small-Cap ESG Optimized exchange-traded fund that excludes producers and large retailers of civilian firearms. It also filed for regulatory approval of a new bond ETF tracking an index of investment-grade bonds of companies with favorable environmental, social and governance standards that excludes makers and large retailers of guns. BlackRock also plans to offer institutional clients new strategies that seek to track five broad indexes, including the S&P 500 and the MSCI World ex-US, that exclude gun producers and retailers.